Annapolis is Maryland’s capital city and was founded way back in 1649. It is home to Maryland’s State House, which once served as the United States national capital in the 1700’s, as well as the United States Naval Academy. Resting on the sparkling Chesapeake Bay surround by waterfronts and history, Annapolis is basically my dream town. 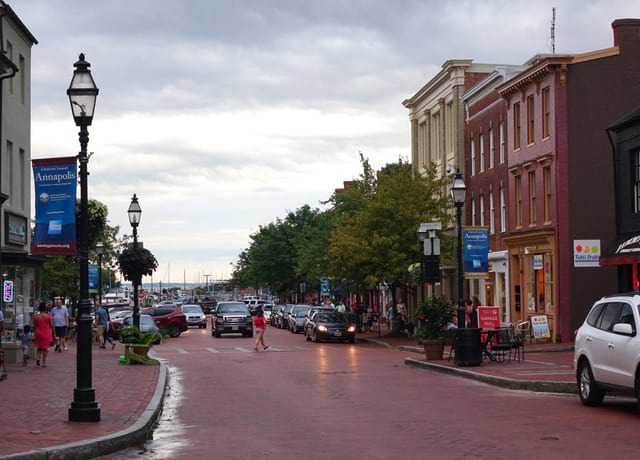 It has history, gorgeous coastline, charming colonial aesthetics, and to top it off, Annapolis is alive with live music. No matter where we travel, we seek out restaurants with live music, because they allow us to enjoy the show with our kids. Lucky for us there are plenty of kid friendly restaurants in Annapolis with live music. 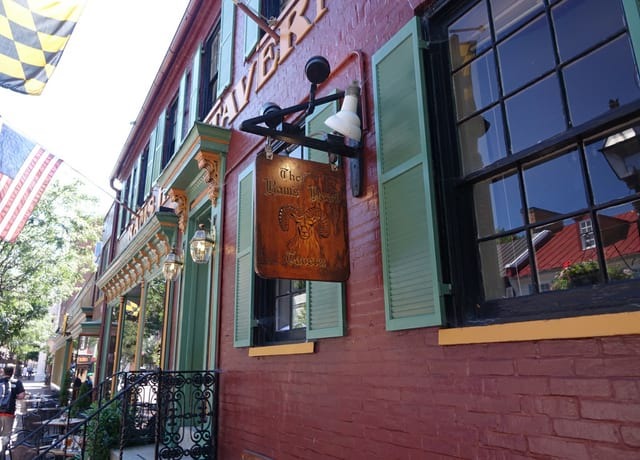 Here are 6 of the best Annapolis live music restaurants, bars, taverns and pubs. Yes, we found ourselves at an Irish pub again. 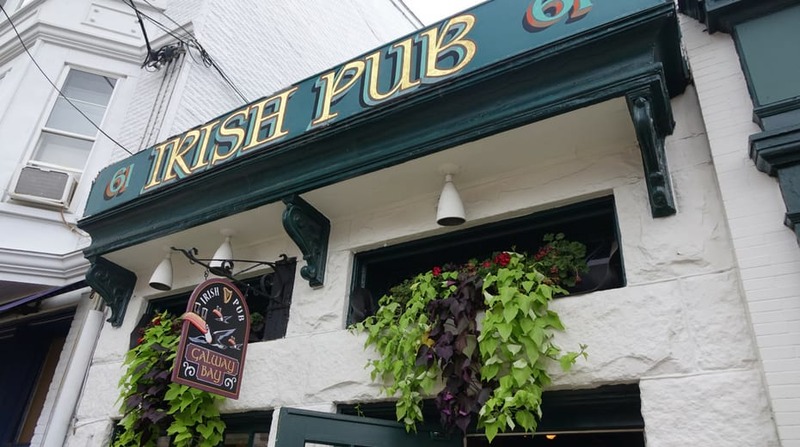 We stumbled upon this little gem as we were strolling down Maryland Ave when suddenly the enchanting sounds of traditional Irish music beckoned us to come inside the Galway Bay Restaurant and Pub for a pint. We inquired and were pleased to discover that the kids were allowed in the pub which was emanating the lively tunes of Celtic, folk-rock musician, Drew Vervan. So we grabbed a high top, ordered a round of cold ones, and settled in for some fun. Galway Annapolis MD holds the undefeated title of Best Irish Pub since 2000 and was featured on Diners, Drive-ins and Dives. 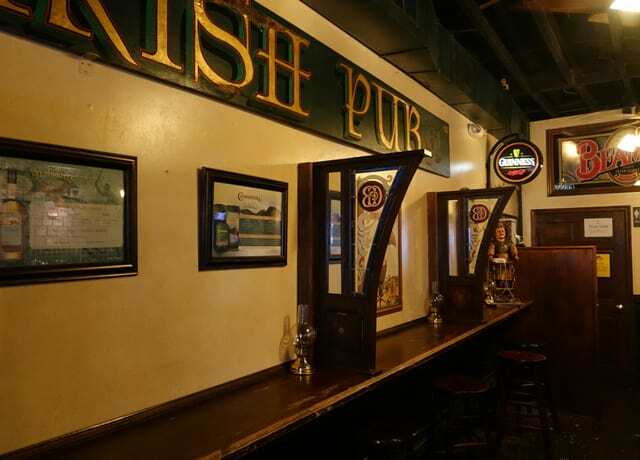 The pub aims to offer visitors an authentic Irish pub experience with traditional cuisine and lively ambiance. Like any good Irish pub, the owners wanted to create an atmosphere that would facilitate exciting conversations, and so you won’t find one TV in the whole establishment. Instead, you’ll find good food, friendly people, cold pints on draft, and traditional Irish music Sunday afternoons from 4pm to 8pm in the pub. Like I always say, “when in doubt find a pub” and luckily for us all, there are plenty of pubs in Annapolis. 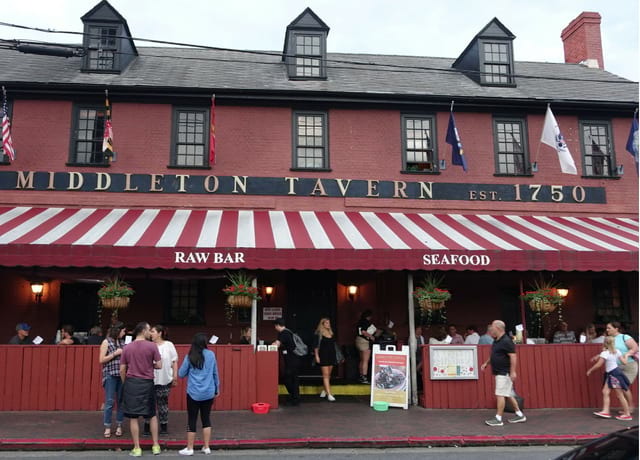 One of the oldest operating taverns in America, Middleton Tavern was established around 1750 and is said to have hosted famous historical figures including George Washington, Thomas Jefferson and Benjamin Franklin. Located on the waterfront, Middleton Tavern has a long history of serving seafaring men and travelers taking the ferry across the Chesapeake Bay. This was one of our favorite spots, dining here twice during our long weekend in Annapolis. Not only was it historical with views of the marina, I was obsessed with the Tagliarini al Limon pasta. It was so lemony, peppery and fresh! To make it even sweeter, on Wednesday nights starting at 8:30pm experience Annapolis Unplugged, where local bands come out to put on a show. The live music continues on Friday and Saturday nights with bands downstairs and a lively piano bar upstairs. For those traveling with kids, you are welcomed to partake in the fun until 10:00pm. 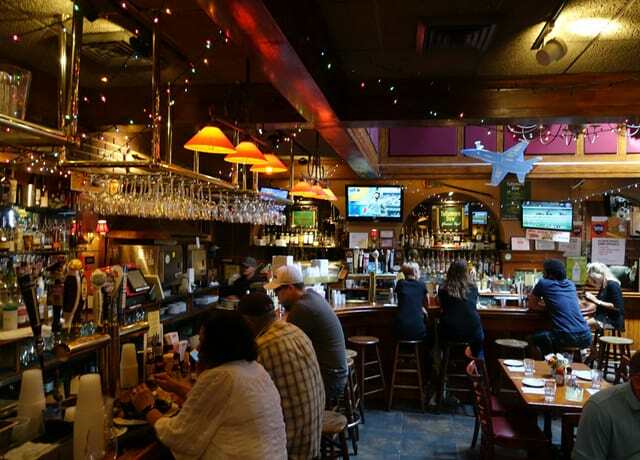 Known for food, fun and beer, Rams Head has been a local favorite for 25 years. 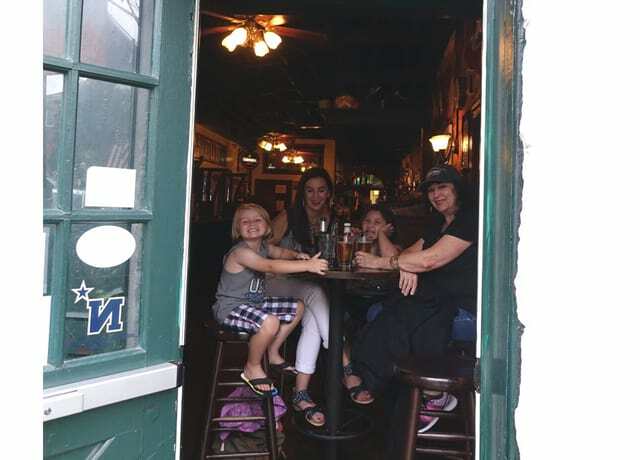 Family owned and operated since 1989, Rams Head Tavern has an inviting atmosphere that makes families feel welcomed. They have a warm dining room, but my two favorite areas of the tavern are the historic pub and the patio, dripping with wisteria. While we were in town, we enjoyed an awesome brunch with a fantastic Bloody Mary bar. However, I was disappointed that they no longer have live jazz on Sundays. On the bright side, Rams Head Tavern Annapolis has live music Sunday, Wednesday, Thursday and Friday. Most Rams Head live music doesn’t start until 10:00pm, which gives you about an hour to enjoy the shows with kids. Once the kitchen closes at 11:00pm the kids have to out of the restaurant. If you do want to take the family for a night of dinner and live music, I suggest Wednesday nights since kids eat free after 4:00pm. On a side note for those 21 and over, next door is Rams Head On Stage. This is a full on live music venue with new concerts announced every Monday. If you are interested in catching a show, be sure to check their calendar and age restrictions, because there are occasions when a younger clientele is permitted. 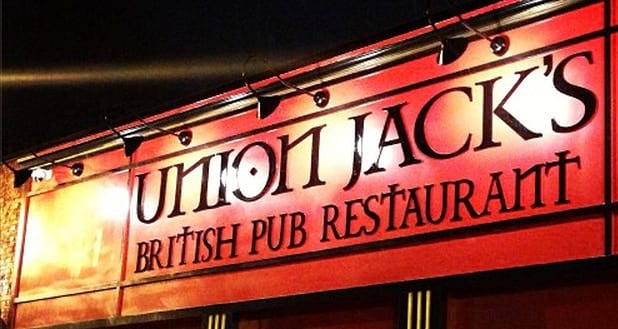 Located near Annapolis Town Centre, about 4 miles inland from the marina, is Union Jack’s. This upscale British pub is not a traditional cozy kind of pub, rather more of a mega-pub. In fact, it is one of the largest Annapolis entertainment venues and sport bars. In addition to billiards, darts and 25 high-definition flat screens, there is live music starting at 9:00pm during the summer. However, be sure to check their event calendar first. Some shows start as early as 5:00pm and some require tickets. The great thing is that kids are welcomed to stay for the live music when accompanied by a parent. They are not kicked out at any specific time, so families enjoy the music together as long as they feel comfortable at Union Jack’s. 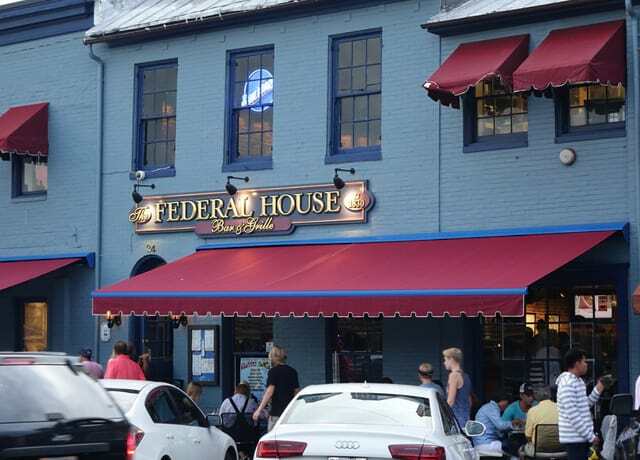 The Federal House Bar and Grille is situated within the historic district, walking distance from Middleton Tavern. Established in 1830, is known for their great seafood menu and raw bar. The patio has lovely views of the marina, while the inside oozes with old world charm. Not only is Federal House family-friendly, it also dog-friendly for those who like to travel with your fur babies. They even have a doggie menu. Ha. What I love is that there is entertainment at Federal House everyday of the week. Monday through Thursday there is live music, which families are welcomed to enjoy together until the kitchen closes at 10:00pm, after that the kiddos have to go. On Friday and Saturday nights at 10:00pm, Federal House becomes a DJ dance party, but, sadly, no kids allowed. In the 1970’s the tavern was purchased by Redskins’ defensive lineman, Fran O’Brien and became a popular steakhouse. 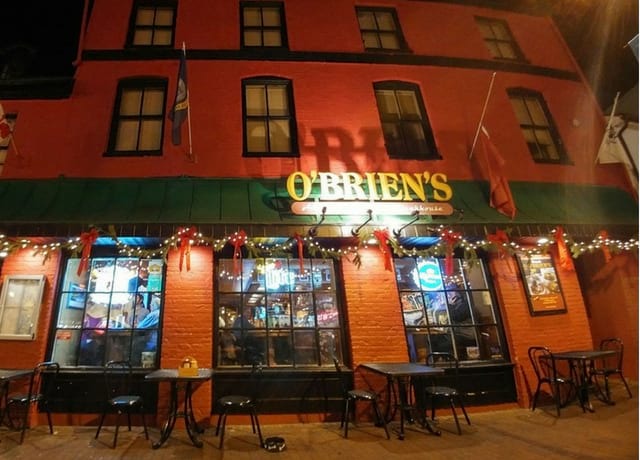 Although, O’Brien no longer owns the tavern, it still bears his name to this day. With such a colorful history, it is no wonder that O’Brien’s Oyster Bar and Grillfish is thought to be haunted. I guess the atmosphere is so lively that even the dead refuse to give up the party. O’Brien’s has open mic night on Monday nights starting at 8:30 and a D.J on Friday and Saturday nights. Kids are welcomed to partake in the fun until 10:00pm. 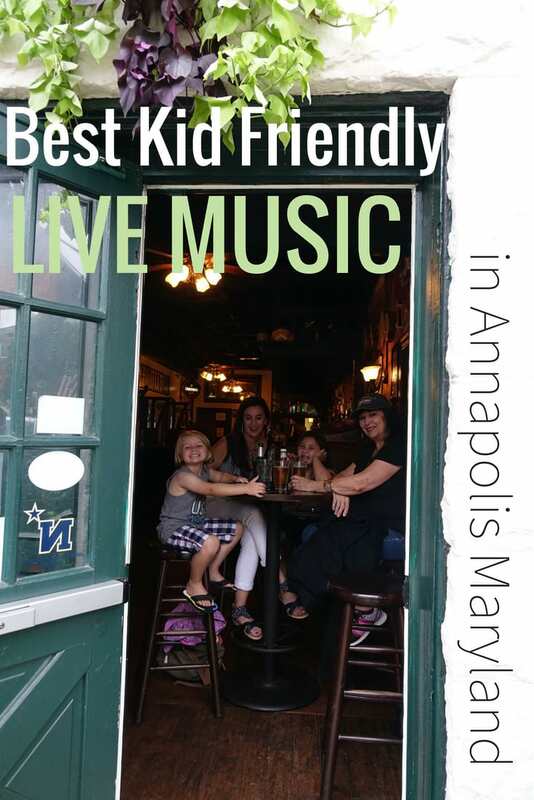 If you are like us and you travel with kids but still crave the excitement of a vibrant nightlife, then Annapolis live music scene is for you. I don’t know what it is about live music that enhances the travel experience, but it has become something special that we seek out repeatedly on the road. It really makes you feel in touch with the local spirit of a town or neighborhood. Annapolis is so beautiful, historic, and so full life. With so many restaurants with live music, you are sure to leave Annapolis with a song in your heart and beat in your step. I love this list! My hubby and I love hitting up pubs on date-nights, but I think it might be time to introduce our kids. We keep promising them a trip to DC soon, luckily these are close enough that we can get to some of them in the same trip. Thanks for the history, too. I always love it when I know the story behind a place! Oh yeah definitely. D.C has some good spots too. The live music makes it nice for the parents, because the kids are entertained.